"Try out the sequel earlier than expected in limited times." Nintendo last night surprisingly announced a Splatoon 2 demo for late next month on the Switch. 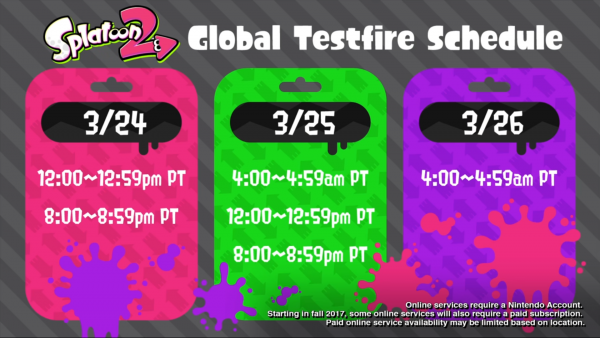 They're doing the Global Testfire approach again where there's set times to play from March 24th to the 26th. Of course Nintendo has to have their own twist to "open betas" and demos, but this approach did work for the original game. The hours to play are listed below. If you were able to go to Nintendo's Switch Preview Tour, you know what to expect in terms of content for these Global Testfire sessions. Let's hope the servers hold up for these hours especially with the first month of a new console. This is actually a nice thing for early Switch adopters to play to take a break from Zelda. Nintendo also recently confirmed spectator mode for Splatoon 2 as well as LAN play as seen in the announcement commercial last year. Splatoon 2 is still slated for a Summer 2017 release for the Nintendo Switch. The Global Testfire sessions will start on March 24th and end on the 26th. I'm ready to be reunited with splat rollers and chargers plus trying out the new Splat Dualies too. Excited to stay fresh again on the Switch? Let us know in the comments below.